NSE Nifty soar and hits all time high this year. Soon nifty is expected to touch 8000 level. Narendra Modi-led government is doing good job and Indian economy is on right track. Investor who purchased stock last year and decided to stay invested is now enjoying as they have doubled their money in one year. 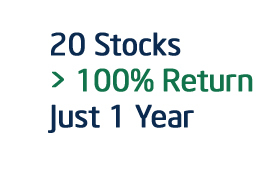 I have come across 20 magnificent stocks that gave over 100% return last year. Here is a list of stocks that brought big smile for investors. Bharat Forge gave 243.9% return in last one year. Share price of Bharat Forge was Rs 220.55 on August 20, 2013 and now it is trading on Rs.758. Second stock on list is Adani Enterprise that gave 209.3% return in one year. Adani Enterprise share price was Rs 160 on August 20, 2013 and today it is trading on Rs 497. Real estate developer stock HDIL is on number three that gave 204.5% return in one year. Stock jumps from Rs 32 to Rs 97 in one year. Automobile sector is no exception in giving good return. Ashok Leyland is leading chart with magnificent 182% return. HPCL stock gave return of 146%. Stock was trading on Rs 181 last year and today it is trading on Rs 447. JSW Steel is another stock that gave 146% return last year. Stock price jumped from Rs 522 to Rs 1286 in one year. Crompton Greaves gave return of 142% in one year. Stock price jumped from Rs 84 to Rs 204 in one year. Power Finance Corporation gave return of 140% in year. PFC stock soared from Rs 113 to Rs 273. In banking sector Yes Bank gave return of 140% in year. Stock was trading at Rs 242 last year and now it is being sold at Rs.582. Another adani group company Adani ports also gave more than 100% return last year. BHEL gave 127% return last year. Stock soared from Rs.101 to Rs. 230 in year. Petroleum Company BPCL is also in list. BPCL stock gave 124% return in last year. UPL Chemical Company gave return of 122% last year. Stock price was Rs 144 last year and today it is Rs 338. Reliance group of company reliance infra gave return of 117% last year. Stock value doubles in short span of one year. ABB gave return of 114% returns last year. Stock price changed from Rs.467 to Rs.1005. 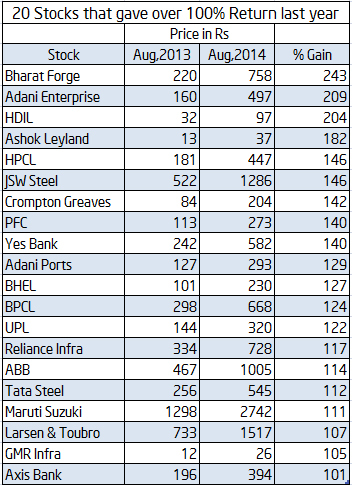 Other stocks that gave more than 100% return last year is Tata Steel, Maruti Suzuki, Larsen & Toubro, GMR Infra & Axis Bank. On analysis it is found that financial service sector, Capital goods sector and infrastructure stocks were major driving force for market last year. This is great that Indian economy is recovering and we are seeing a positive response from investors. I think these things will also encourage foreign inflow in Indian market and that in turn will help in balancing $/Rs exchange rate. I am a non med students but love economy and learned small concepts related to it. Could you please enlighten me about the DMAT account and how I can purchase stocks.